Chris proposed in Cambodia! It was a surprise holiday and he had to wangle some unpaid leave with my boss as I had already used all my annual leave for the year. He had to keep delaying due to various illnesses and even got stopped on the way through the airport by security, with the ring in his bag! 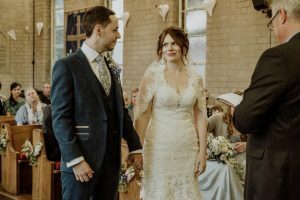 I had absolutely no idea it was coming (my friends and I had suspected a while before the holiday when he first told me we were going away, but he did well since then to throw me off the scent – mostly I didn’t believe he was organised enough to plan something so elaborate!). He surprised me with a boat trip to one of the smaller islands (I thought it was a group trip but he surprised me in the morning with the boat to ourselves), snorkeling in the sea and a special bbq on the beach (which I thought they did for all guests but later found out it was just for us!). We watched the sun go down and as it was setting he got down on one knee and asked me to marry him! When we got back to the resort he had arranged for a private dinner table right by the sea with bubbly to celebrate. Guests and locals heard there was going to be a wedding and congratulated us all night! The next morning I woke up and genuinely thought it was all a dream, it took a while to sink in! 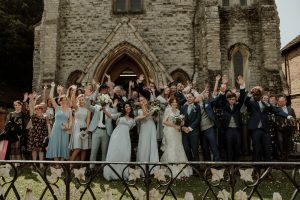 We got married at Henley in Arden Baptist Church, and held the reception at the Guild Hall. 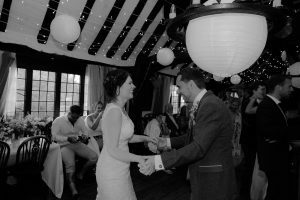 Our venue was largely determined by budget, and at the time we lived in Shirley – Henley was a lovely town and close by. We viewed the hall which we knew we could make our own and my Dad, a Baptist Minister, had links to the church so it slotted into place. How did you find our Boutique? 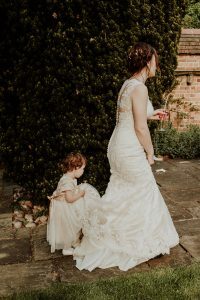 I found your boutique when I was in Henley showing the venue to my mum – it looked beautiful from the outside and had lovely dresses on display, I then looked on the website and booked a visit. I wasn’t expecting to find my dress but the dresses were all so amazing it was hard to pick just one! I loved the dress as soon as I put it on, even though it was miles too big for me! I loved the lace and the unique colour. It had a definite vintage feel which reflected my own taste and style, and made me feel like ‘me’ if that makes sense! I also loved the fit, I felt it was really flattering. I had two bridesmaids, my best friend from school and my best friend from university. They are both such amazing friends and it was so good (and fun!) to have them planning the wedding with me. They were great on the day and I hope to return the favor one day! They wore silky blue dresses from Boohoo’s bridesmaid range. 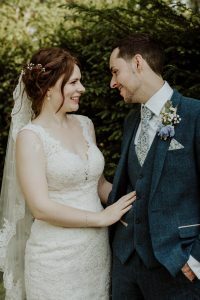 Again, largely determined by budget we found these dresses in the sale – I wanted a material different to mine which was very Lacey, something contemporary and flattering too. I love the colour and got the glitzy cardigans from Monsoon to add a bit of sparkle! The whole colour scheme worked really well in the end, even though we didn’t really have a ‘scheme’, it was more a ‘do it yourself and see what happens’ kind of vibe! He looked lovely in a Peter Posh navy tweed suit with a lovely floral tie and nice shoes! The groomsmen’s suits were also hired from Peter Posh. The day was amazing! 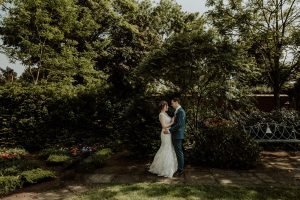 It was really personal (my Dad married us) intimate, relaxed, informal, fun and sunny! 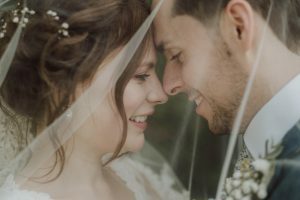 We had a lovely ceremony followed by a short walk to the reception which looked like something out of a fairytale by the time we were done, I was over the moon with how it turned out (after 8 hours the day before slogging with my bridesmaids, family, groom, friends etc! ), followed by garden games, sipping cocktails in the sun, barn dancing and speeches with pudding! We also had a live band who were amazing and really got everyone up and dancing. I couldn’t have hoped for more from our big day and am so grateful to everyone who helped make it happen! 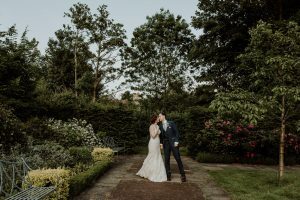 Flowers – we did them ourselves! so Mum, Hannah, Amber, me, my brother Chris & my aunty Jacqui!